Since the 1960's, Université Laval has continuously invested in Northern research supporting the efforts of about 50 of its professors and hundreds of students in different departments. Recently, these investments have amplified spectacularly as Laval hosted two Arctic NSERC Research Network (NOW and CASES), the NCE ArcticNet, the Amundsen and the SAON-CEN network of arctic research stations. The northern research capacity assembled over the years at Université Laval is now unmatched elsewhere in academia in Canada or abroad. The research program of the CERC will build on these past and recent investments to improve Canada's capacity to study and manage its changing arctic territories and seas. Québec-Océan mobilizes the resources and the creativity of Québec researchers to develop excellence in oceanographic research and training, pooling scientific equipment, technical expertise, and intellectual and financial resources from its members. Québec-Ocean is pursuing its ambitious program on the function and integrity of Arctic and subarctic marine ecosystems of ice-covered seas under climate change. CIÉRA collaborators study Native, northern, and circumpolar issues. Its research program comprises four major axes: historico-cultural, socio-economic, politico-legal and education and training in an intercultural environment. Based at the Public Health Research Unit of Université Laval medical research centre, Nasivvik (Inuktitut for "vantage point") participates in the Aboriginal Capacity and Developmental Research Environments (ACADRE) of the Canadian Institutes of Health Research. The Centre focuses on contaminants in the northern environment and food chain and their impacts on health; the direct and indirect effects of the changing northern climate on individual and community health; and relationships with chronic diseases among Inuit populations. ArcticNet is a network centre of excellence, based at Université Laval, that brings together scientists and managers in the fields natural, health and social sciences with their partners from Inuit organizations, northern communities, federal and provincial agencies and the private sector to study of the impacts of climate change and modernization in the coastal Canadian Arctic. Over 110 ArcticNet scientists from 27 Canadian universities and 5 Federal departments collaborate with research teams from around the world, spearheading the on-going revitalization of Canada's scientific role in the Arctic. Also hosted at Université Laval, the NCE GÉOIDE brings together many of Canada's leading experts in geomatics from academic, government and industrial institutions. GEOIDE's objectives include "to drive the research and development of new geomatics technologies and methods via multidisciplinary collaboration in a fully networked environment; and "to identify new areas of opportunity for geomatics as an effective enabling technology and pursue research in these areas". GEOIDE has expertise in spatially distributed sensor networks, and the analysis, integration, and rapid delivery of spatial data. This network offers exciting new opportunities to advance the spatial data acquisition, modelling and analysis within the proposed Chair program using automated sensors and satellite imagery to study the three dimensional ecosystem characteristics of the rapidly changing Canadian Arctic. Université Laval provides extensive office space for the secretariats of all four research centres listed above, and for ArcticNet and GEOIDE. It also supports the broad spectrum of laboratories for advanced environmental and data analysis, including separate facilities for research in arctic plankton ecology, polar molecular oceanography, polar marine and freshwater ecology, arctic climatology, arctic paleo-ecology, northern vegetation ecology, northern fish genomics, northern wildlife ecology, northern seas biogeochemistry, ocean gas flux processes. It operates on campus the Laboratoire regional des sciences aquatiques (LARSA: www.larsa.ulaval.ca) for the scientific rearing of aquatic animals including organisms from the arctic and subarctic, and the Laboratoire REGARD, a CFI funded laboratory for augmented reality visualization and mobile Geomatics. Université Laval has undertaken a major investment program in its digital library facilities over the last ten years, and has access to all major online journals and databases. However, by far the most important investments of Université Laval in northern research have been in support of two CFI-funded major infrastructures: the Research Icebreaker Amundsen and the SAON-CEN network of Arctic observing stations. In recent years, the Department of biology has proceeded with a full revision of the undergraduate teaching of ocean sciences and the development of a PhD in oceanography. In both biology and geography, undergraduate and graduate courses are strongly biased towards northern issues, providing students with a unique arctic-oriented curriculum. For example, Fortier's Physical Oceanography, Tremblay's Marine Ecosystems, Vincent's Limnology: Dynamic Aquatic Ecosystems, and Pietnitz's Paleoclimates all focus on climate change and the functioning of northern marine and freshwater ecosystems. The same apply to terrestrial ecology and anthropology. Arctic specialists at Université Laval have an impressive record in leading and contributing to large national and international multidisciplinary collaborations. At the international level, they led the International North Water Polynya Study (NOW 1997-2001) and the International Canadian Arctic Shelf Exchange Study (CASES, 2001-2007), two major Research networks funded by the Natural Sciences and Engineering Research Council of Canada (NSERC). At the Canadian level, the Laval-based NCE ArcticNet represents the most intense and integrated research effort in the Arctic with 28 projects participating in 4 IRIS studies (see section 1.2). As part of the International Polar Year (2007-2009), ArcticNet Investigators lead or co-lead 11 of the 44 projects funded by the Federal program and 6 of the 11 NSERC-funded projects. Researchers at Laval contribute to a majority of the 44 Federal programs, and lead the Arctic WOLVES (Impact of Climate Change on Tundra Wildlife), MERGE (Microbial Biodiversity of High Arctic Ecosystems), Arctic-SOLAS (Surface Ocean Lower Atmosphere Study), and the Integrated Research Program on Arctic Marine Fat and Lipids programs. In particular, Laval-based researchers participated massively in the six IPY programs supported by the Amundsen, including the Circumpolar Flaw Lead System Study (CFL, www.ipy-cfl.ca) and the Inuit Health Surveys "Qanuippitali ? ", the two largest components of the Canadian IPY effort. Finally, as part of the International Partnership Initiative of ArcticNet, Laval-based researchers are major players in the USA-Russia-Canada-UK-Germany international Nansen-Amundsen Basin Observatory System (NABOS) and the French-led MALINA, an international study of Arctic Ocean photochemistry and photobiology conducted on the Amundsen. Université Laval and the University of Manitoba work very closely together, being the two largest institutions involved in the ArcticNet NCE and the NGCC Amundsen program. We believe that, given the present urgency and political will for Canada to reclaim its missing Arctic dimension, there is need and room for two Arctic CERCs. Accordingly, we have organized our applications to be complementary, both making significant incremental gains to an already excellent national Arctic research network. The Canadian Research Icebreaker Amundsen (www.amundsen.ulaval.ca) is a national facility with an international mandate. It is operated jointly by Québec-Ocean, ArcticNet and the Canadian Coast Guard and has its administration office at Université Laval. The 98-m long, 14000-HP icebreaker with a 6000-ton displacement was mobilized for science in 2003. The Amundsen has become a major catalyst in the revitalisation of Canadian Arctic science by giving Canadian oceanographers, climatologists, geologists, terrestrial ecologists, and epidemiologists and their international collaborators unprecedented access to the Arctic Ocean. Canadian Polar Commission, June 2008. The SAON-CEN network of Arctic observing stations. 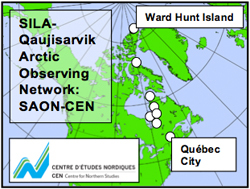 Université Laval also manages, through Centre d'Études Nordiques, the SAON-CEN network of research stations for terrestrial and coastal aquatic research. This network extends over 4000 km, from a reference site near Québec City to Ward Hunt Island at latitude 83N, at the edge of the Lincoln Sea.